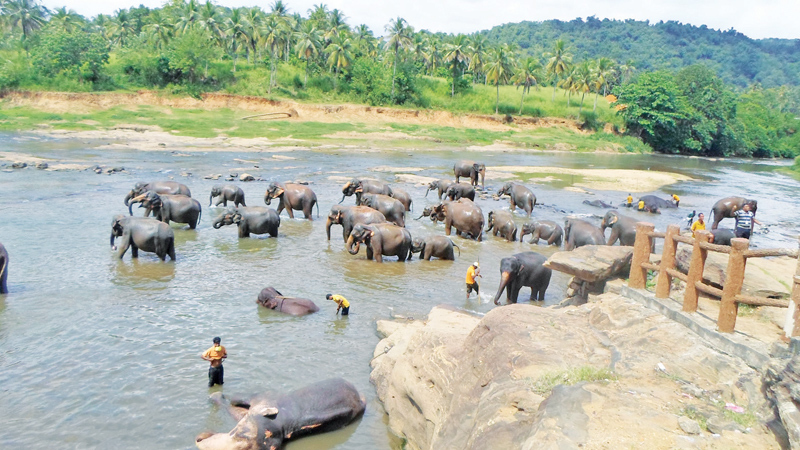 Elephants bathing in Maha Oya. Local and foreign tourists visiting the Pinnawala elephant orphanage undergo many inconveniences as authorities have failed to provide them with basic facilities. The tourist attraction brings a large revenue to the Zoological Department. Nearly 800 people in the area earn their living by running various stalls near the elephant orphanage. There is not enough space for parking in the area. Many vehicles can be seen parked on either side of the Kegalle - Rambukkana main road. The orphanage management has failed to provide sufficient sanitary facilities. There are two toilets near the police post but they have hardly been cleaned. There is no platform at the orphanage to view elephants bathing. As a result, tourists have to pay private hotels to view elephants from their premises.